This is a very easy and quick omelette. Over medium heat, place a teaspoon of olive oil in a small (6-inch) non-stick frying pan. In a small bowl, whisk eggs and milk together. Gently pour egg mixture into the pan. Swirl the mixture around to evenly coat the bottom of the pan. Cook the omelette for a few minutes and then carefully flip it over in one piece. 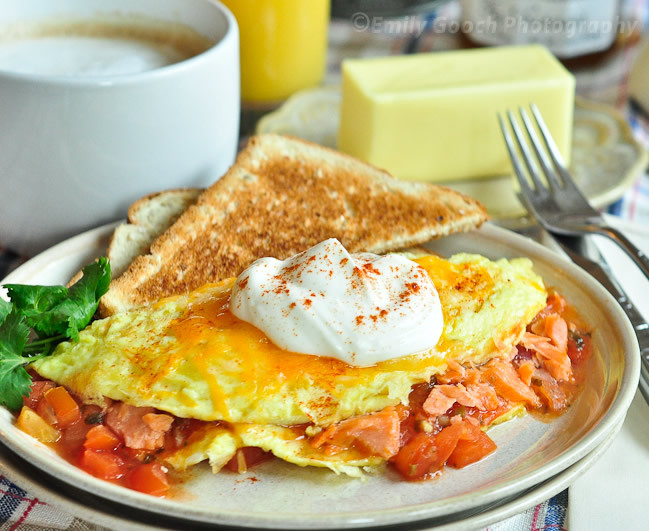 Add shredded cheese, salsa, and smoked salmon on half of the omelette. Carefully, fold the half without the filling over to form a crescent shape. Cook for couple more minutes and remove from pan. Put the omelette on a plate, sprinkle with a tablespoon of the shredded cheddar cheese and put in the microwave for about 30 seconds or until the cheese melts. Add a tablespoon of sour cream and sprinkle with some smoked paprika. Enjoy! Note: For a spicy omelette, use hot salsa.